The 2015 Land Rover Range Rover Sport luxury SUV offers owners the finest British trappings wrapped in a modern design that is as capable off-road as it is on. Powerful, dynamic and highly versatile, the Sport's optional 3rd-row seat now places it in direct contention with such respected SUVs as the Audi Q7 and BMW X5. 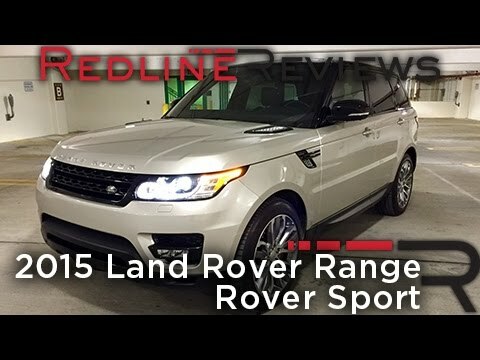 My 2015 Range Rover Sport has been very reliable. I do find the navigation screen to be slow and wish that it connected with Waze. It's a luxury car but worth the price. Valets park it up front. Easy to see the road around you. Sits up high. Drives well. Jaguar Land Rover North America, LLC (Land Rover) is recalling certain model year 2015 Range Rover and Range Rover Sport vehicles manufactured June 2, 2015, to June 11, 2015. In the affected vehicles, the second row seat back may not latch properly, especially in the center section. In the event of a crash, if the seat back is not properly latched, the seat belt may not properly restrain the occupant, increasing their risk of injury. Land Rover will notify owners, and dealers will inspect the second row seat mechanism, replacing it as required, free of charge. The recall began on November 12, 2015. Owners may contact Land Rover's customer service at 1-800-637-6837. Land Rover's number for this recall is P072. If the engine seizes there is an increased risk of a crash. Land Rover will notify owners, and dealers will replace the affected engines, free of charge. The recall began February 27, 2015. Owners may contact Land Rover customer service at 1-800-637-6837. Land Rover's number for this recall is P055. Jaguar Land Rover North America, LLC (Land Rover) is recalling certain model year 2015 Land Rover Range Rover, Range Rover Sport, and LR4 vehicles manufactured January 6, 2015, to January 23, 2015. The affected vehicles have wheel lug nuts that may crack and detach from the wheel hub stud. If one or more of the wheel lug nuts crack or detach from the wheel hub, the remaining lug nuts may be unable to keep the wheel secured to the vehicle. If the wheel detaches, loss of vehicle control would result, increasing the risk of a crash. Land Rover will notify owners, and dealers will replace the wheel nuts with new wheel nuts, free of charge. The recall began March 23, 2015. Owners may contact Land Rover customer service at 1-800-637-6837. Land Rover's number for this recall is P056. Jaguar Land Rover North America, LLC (Land Rover) is recalling certain model year 2013-2014 Land Rover Range Rover vehicles manufactured August 16, 2012, to January 8, 2014, and 2014-2015 Land Rover Range Rover Sport vehicles manufactured May 7, 2013, to February 12, 2015. In the affected vehicles, the brake vacuum hose may have been incorrectly routed allowing a hole to be worn ito it. If a hole is worn into the brake vacuum hose, a complete loss of braking assistance could occur, lengthening the distance required to stop the vehicle and increasing the risk of a crash. Land Rover will notify owners, and dealers will inspect the brake vacuum hose and correctly route it, as necessary, free of charge. Any brake vacuum hose that is damaged will be replaced, free of charge. The recall began March 2, 2015. Owners may contact Land Rover customer service at 1-800-637-6837. Land Rover's number for this recall is P052.